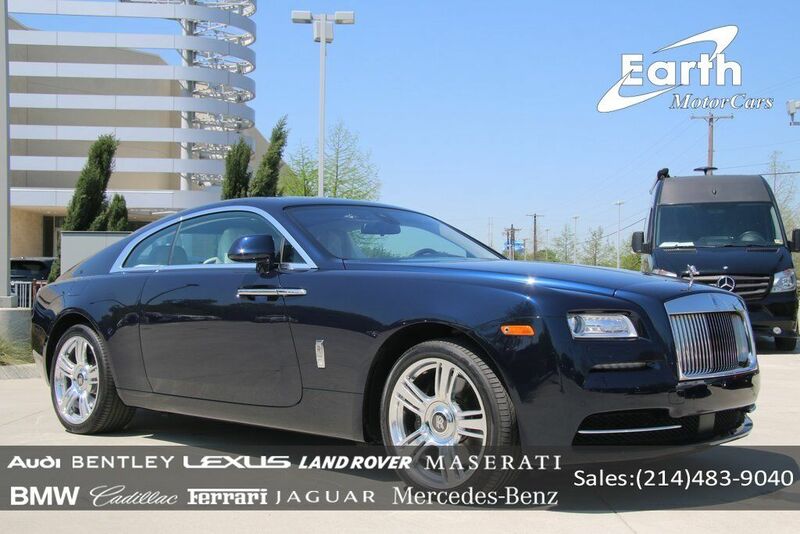 Earth MotorCars is Proud to Present This: 2015 Rolls-Royce Wraith Starlight - $361K MSRP Clean CARFAX. CLEAN AUTOCHECK REPORT, ABS brakes, Active Cruise Control w/Stop & Go, Adaptive Headlights, AM/FM/CD/MP3 w/Navigation, Bespoke 1300W Audio, Compass, Driver's Assistance Systems One, Driver's Assistance Systems Three, DVD-Audio, Electronic Stability Control, Emergency communication system, Front Camera & Radar Parking Distance Sensors, Front dual zone A/C, Heads-Up Display, Heated door mirrors, Heated front seats, Heated rear seats, Illuminated entry, Leather Heated Front Bucket Seats, Low tire pressure warning, Navigation System, Night Vision Camera, Rear dual zone A/C, Remote keyless entry, RR Logo To All Headrests, Starlight Headliner, Traction control, US Wraith Package, Wheels: 21" 5 Spoke Polished Alloy.This vehicle is also eligible for our EXCLUSIONARY EXTENDED WARRANTY that covers a wide variety of components (certain exclusions apply).....Please ask your sales representative for details.Welcome to Dallas Fort Worth's Premier Luxury, Exotic and Classic Cars Dealership. We specialize in offering the Finest Vehicles, Providing Outstanding Customer Service, Obtaining the Best Financing Options and Stocking a Large Selection of Luxury Vehicles, Exotics, Classic Cars and More! See for Yourself what Thousands of Customers have Discovered over the Years and Make your Next Purchase from Earth MotorCars! Our Goal is to Make you a Customer for Life!Learn more about us by calling 214-483-9040 or via e-mail at sales@earthmotorcars.com. Visit us on our Website at www.earthmotorcars.com.